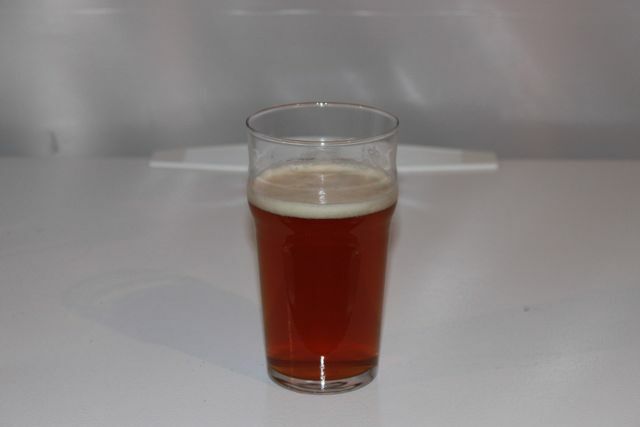 This past summer I brewed a batch of a single hop IPA using the Chinook hops variety. I was a fan of the beer, noting that at ~52 IBUs, as calculated by iBrewMaster, it seemed to be perfectly balanced with its modest alcohol level. This time, however, I changed the hopping a little bit. The recipe actually calls for the beer to be dry hopped approximately one week into fermentation depending upon the activity in the carboy. For my first batch I did not actually dry hop the beer. I do not know why exactly. It probably had to do with some recent sour experiences with dry hopped beers that were over the top in terms of hoppiness. So, one ounce of Chinook hop pellets were put into the carboy and it was sealed for another three weeks. The results really speak for themselves. This may be the best beer that has ever been made by my hands. Whereas the first batch was a pretty standard IPA the dry hopped version is outstanding. The extra resinous flavors and aromas, without the accompanying bitterness that would have been contributed via boiling the hops in wort, produce a wonderful assortment of palate sensations. This is a beer that is never boring. Slowly I have been coming around to the idea of dry hopping beers. 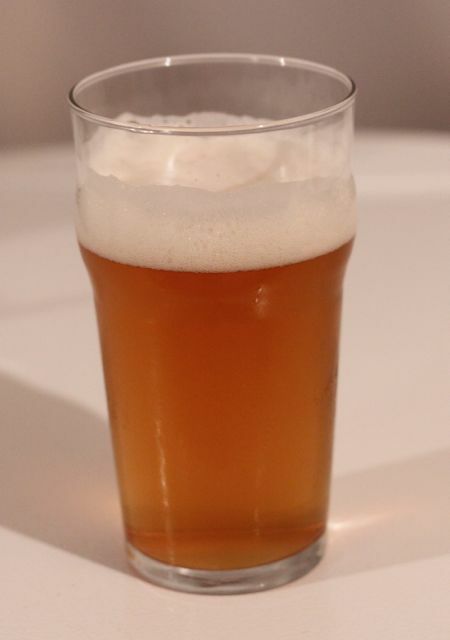 It is the effect of having tried beers that use the technique to produce a unique beer without being a gimmick. First off, this has to be the most inconsistently bottle conditioned batch of beer that I have had the pleasure of drinking. Some bottles almost foam out the top upon opening. 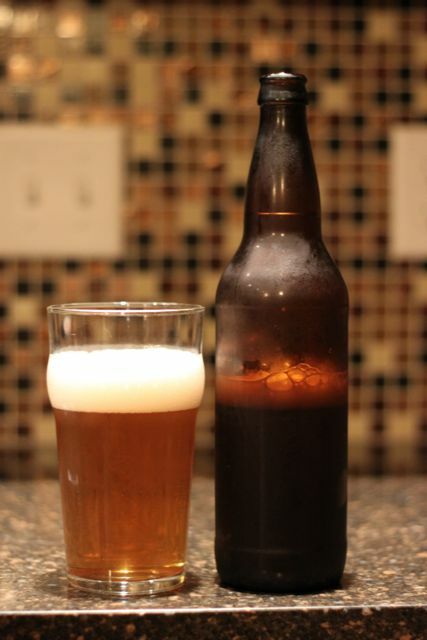 Other bottles barely have enough carbonation to produce a thing ring of head around the interior rim of the glass. I do not get what happened with this batch, but it is one more push toward force carbonating my beer with a keg system. The estimates from iBrewmaster put the alcohol at 5.37% and the bitterness at 19. It’s a little hard to believe the estimate of the alcohol content because after a couple of these you start to feel things get soft around the edges. One of my fears was that the yeast used—Wyeast 1214 Belgian Abbey—is known for producing banana esters at higher temps. Naturally, I decided to brew this recipe when we went through a period of three weeks where the temperature barely ticked below ninety degrees and commonly topped out closer to 100. We were fried and I was afraid my beer was going to come out like mofungo. Good news is that my fears were not realized and the beer does not taste of bananas. Whew! Note to anyone using Wyeast 1214: it’s a slow start. However, once this batch got going it was explosive. I was afraid my blowoff preventer was not going to be able handle the volume of gas being belched out. I really wanted to like this beer. 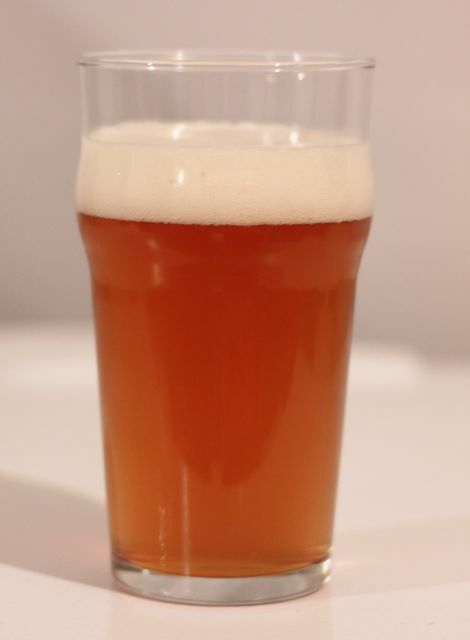 It seemed, from the description of the recipe, that it would really hit the spot as a late summer/early fall beer to drink on those days when the temperatures drop as the sun sinks below the horizon. You know, something to bridge the season between the lawnmower beers of summer and the “heavier” beers of the cooler months. It just did not come together in a way that I found satisfying. The real problem that I had with this beer was that it was too sweet without any accompanying bitterness or body. It sort of reminded me of the honey ales that friends have made where the sweetness of the honey added later in the brewing process overwhelms any other flavors. With only 1 ounce of Styrian Goldings hops to provide bitterness, you are not likely to get much balance against six pounds of malt extract and a pound of candi sugar. 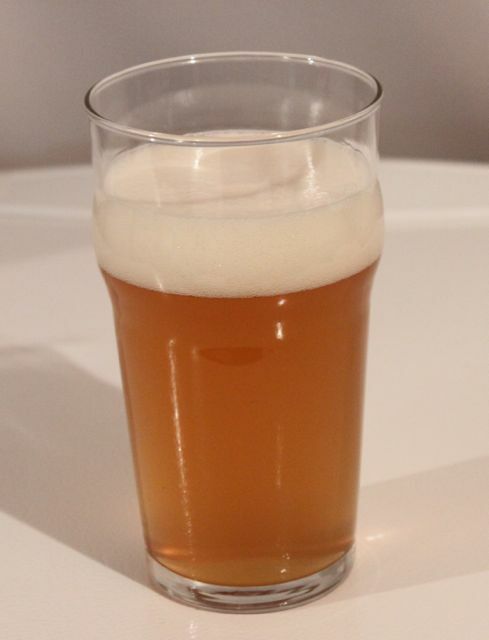 If I were to brew this recipe again, I would opt for a more potent hop or more hops in general to provide some bitter balance to the sweetness of the malt and sugar in the wort. Next up is a batch of American Amber Ale and a Chinook IPA. Stay tuned to see if I go the keg route and skip the horror that is two hours of my life spent bottling. The weather the past couple of weeks has bordered on perfect for Iowa in mid-August. I am talking about mid-70s during the day, abundant sunshine, and temps that drop into the 50s at night. Perfect for sitting around a patio fire and enjoying a few homemade beers. For the past month or so, I have found myself imbibing stronger and stronger beers which usually means my nights end earlier and my mornings start later. Or at least start a little slower. Nothing starts later when you have two children below the age of six in the house. According to my iBrewmaster calculations this beer have it coming in at ~5.2% ABV and a modest ~26 IBU. The alcohol in the estimate seems a little high after having had a few pints, however I know that some beers drink lighter than the stated alcohol level would have you believe. Based on mouth feel alone I would have pegged it at around 4% ABV. Oh well. The real winning aspect of this particular beer in the heat of Iowa in August is that it is effervescent. It’s not just about the bubbles, but having long lasting bubbles in the brew helps. 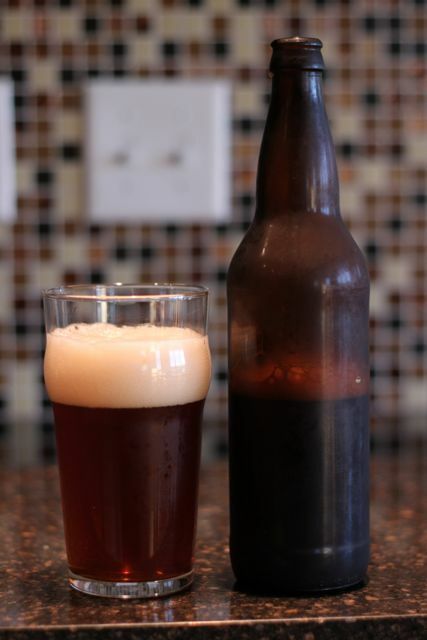 The recommended yeast was Wyeast 1762 Belgian Abbey II, which according to its description is known for its dry finish. True to the description the Lefse Blonde really does finish dry and clean. Not quite lager-like, but much cleaner than American style pale or amber ales. This is a real winner of a recipe. The Phat Tyre Amber Ale kit, also from Northern Brewer, intrigued me for a different reason. 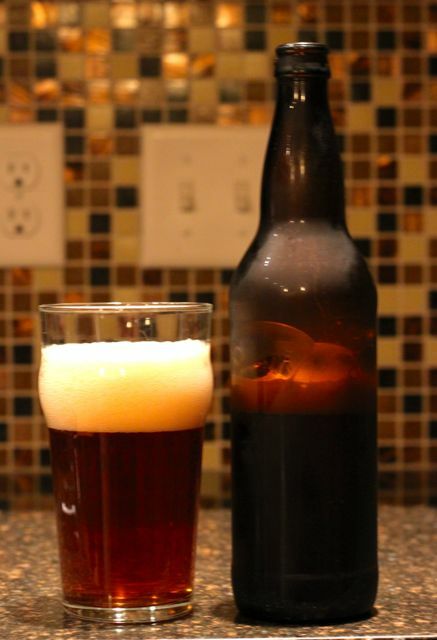 By the name you can guess that it is a take on New Belgium’s classic Fat Tire Amber Ale. I remember a time when Fat Tire was not distributed widely in the Midwest and people treated it like some kind of golden liquid from a faraway land. My father may have talked about a time when people bootlegged Coors from Colorado, but for my generation we bootlegged Fat Tire Amber Ale from Fort Collins. Something however is just not right with this beer. Even though it used the same yeast as the Lefse Blonde—Wyeast 1762 Belgian Abbey II—the flavor was very different. I am not talking about the malt profile or the hops, but the flavors that the yeast is primarily responsible like those arising from esters. Thankfully, the beer does not have that banana smell that I cannot stand. Nothing will ruin my mood more than having a batch turn out to have banana aromas or flavors. It does not go down the drain, but it quickly becomes the beer that I serve my guests. Part of the problem may be that the room in which the beer was fermented probably had temps a little higher than normal. Another issue may be that Belgian-style beers or ones that use Belgian-style yeasts are prone to developing different flavor profiles over time. 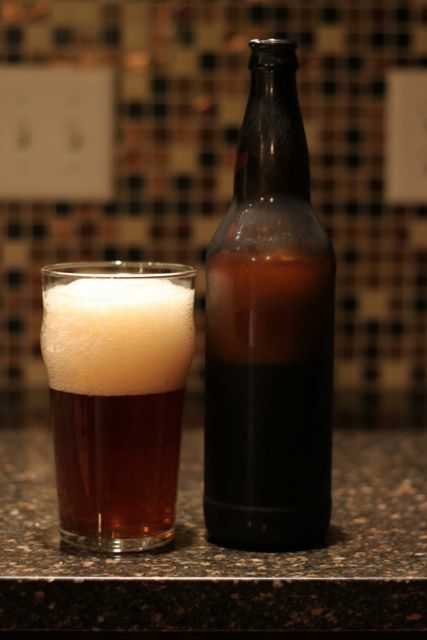 I may just need to allow the beer some extra time in the bottles for the flavors to really mellow or even out. At least that is my hope. Right now I have a batch Le Petite Orange in the carboy. It is about halfway through its primary fermentation, so I am quite a few weeks away from any tasting.